Notes: Rose family. This species is an alien, having largely replaced the native Blackberry where it takes over in disturbed areas. The underside of the leaves are white, whereas the California Blackberry (Rubus vitifolius, Rubus ursinus) have green on the underside. The fruit is delicious. The berries can be used for dye and the roots boiled for tea that can be used for diarrhea and menstrual pain. Blackberry bushes can be invasive. Himalayan blackberry (Rubus discolor) is a shrubby weed that is native to Eurasia and has naturalized throughout California in riparian areas and other moist, disturbed sites. This plant forms dense thickets that become a thorn in the side of Mother Nature and land manager alike. Himalayan blackberry is known to take over entire stream channels and ditch banks shading out nearly all other vegetation. In California, Himalayan blackberry is the most common blackberry picked and eaten by humans. The stems are covered with heavy, broad-based prickles and the larger stems are distinctly five-angled. The leaves are clustered in fives and their undersides are white. The white-to-pinkish petals are each about 10-15 millimeters (0.4-0.6 inches) long. The remainder of the article includes a discussion of eradication methods. 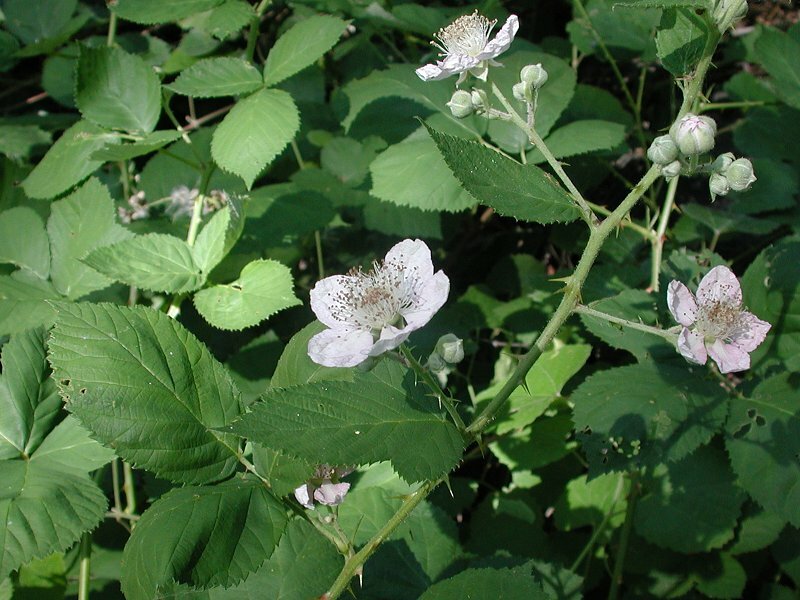 Washington State University in Lake Whatcom County (includes Bellingham) lists Himalayan Blackberry as one of its ten most unwanted pests.